Donald Trump is doubling down on a health care agenda that has left millions more Americans uninsured since he took office. As President, I will expand access to quality health care, and make universal coverage my first legislative priority. Surveys generally show that the number of uninsured Americans is growing, but the size of the increase is unclear. The Centers for Disease Control and Prevention (CDC) found that as of September, there were roughly 1 million more uninsured Americans than in 2016. A survey from Gallup, however, estimates that about 7 million more adults are uninsured under the Trump administration. Castro was repeating a claim often made on the left – that millions have lost coverage due to the GOP’s efforts to repeal the 2010 health care law. Earlier in 2019, Democratic presidential candidate Bernie Sanders claimed that 7 million more Americans were uninsured under Trump. President Trump, you want to talk about a crisis? 7 million Americans have become uninsured since you took office. The uninsured rate is the highest in 5 years. There are multiple surveys done each year to gauge changes in health insurance coverage. The one published by the Census Bureau is considered an authoritative source on the topic, but the agency has only estimated coverage rates for 2017, half of Trump’s time in office. The survey on insurance coverage for 2018 will be released in the fall of this year. The most recent report, published in September, found that 28.5 million, or 8.8 percent of people in the U.S., did not have health insurance at any point in 2017. This is a slight uptick from 2016, when 28.1 million people were uninsured, but the Census Bureau does not consider the latest figure to be statistically different. The CDC published a survey of its own that covers the first nine months of 2018, allowing for a more complete measurement of the uninsured population under Trump. From January through September, it found that 29.7 million individuals were uninsured at the time of the interview. In 2016, that number was 28.6 million, translating to a roughly 1 million increase under Trump. “Actions taken by the Trump Administration, particularly repeal of the individual mandate, have likely reduced the number of people with health insurance relative to what it would otherwise be,” Matthew Fiedler of the left-leaning Brookings Institute told The Daily Caller in an email. Nonetheless, the CDC reports that the uninsured rate has only crept up, rising from 9 percent in 2016 to 9.2 percent for the first nine months of 2018. “That is likely because upward pressure on the uninsured rate from the Administration’s policy changes has been offset by downward pressure from other sources, such as a strengthening labor market and continued phase-in of Medicaid expansion in states that adopted expansion late in the Obama years,” Fiedler said. An article published in Health Affairs, which reported data as of Q1 2018, also found an increase among a narrower population – non-elderly adults – after Trump assumed office. “While rising private health insurance premiums may be contributing to coverage erosion, policy choices such as reductions in funding for outreach and enrollment assistance and public uncertainty about the continuation of ACA coverage options given ongoing efforts to change the law could also be having an effect,” the authors wrote. The Commonwealth Fund, on the other hand, found no statistical change in insurance rates among the non-elderly adult population as of late 2018. 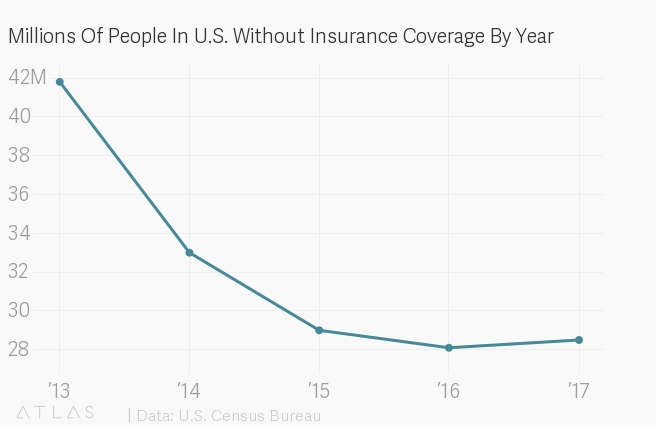 In absolute terms, it found that 1.4 million more people were uninsured compared to 2016. Another survey, however, suggests that the uninsured population may be growing rapidly. Many politicians, including Sanders, have used the findings of this survey to claim that millions are losing health insurance under Trump. Castro’s campaign did not immediately respond to a request for the source of his claim. Ultimately, a wide range of estimates makes it difficult to say how many people have lost health insurance over the last two years. “It looks like the number of uninsured is rising again, but the size of the increase is still not as clear as we might hope,” Professor Leighton Ku, director of the Center for Health Policy Research at George Washington University, told the Caller in an email. While the Gallup survey provides another data point, experts generally consider Census data to be more authoritative. “The problem is that the Gallup survey is not considered the most definitive survey of information about the uninsured, but is the fastest,” said Ku. The Trump administration ended federal payments for cost-sharing reductions (CRSs), or discounts offered by insurers to reduce the cost of deductibles, co-payments and co-insurance for consumers, after it decided the payments were unlawful.